What's in a name? 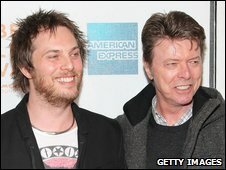 Quite a lot, if your father is David Bowie and you happen to have been born Duncan Zowie Haywood-Jones. 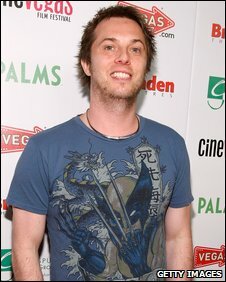 Now, though, Duncan Jones is making a different name for himself: not as the son of a British music legend, but as a debuting feature film-maker. Having cut his teeth on music videos, shorts and commercials, the affable 38-year-old is hardly an absolute beginner. Yet he does accept that, up to this point, his fame has been based more on his family connections than his body of work. "The honest result of it is it's opened some doors more easily than others," he tells the BBC News website. "However, the expectations of what I'm able to do once I'm through that door tend to be much higher. "I think it works for me and against me," he continues. "On the whole, though, I think people are interested in seeing what I'm capable of doing." 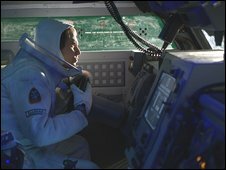 He hopes people will be keen, therefore, to watch Moon, a science-fiction thriller about a lonely lunar astronaut who has been stationed on the titular satellite for three years. His only companion is Gerty, a sentient computer with a basic ability to emote and empathise that makes it much more than a tin machine. 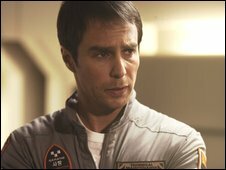 Sam, played by Sam Rockwell, is looking forward to returning to Earth to be reunited with his wife and young daughter. That all changes, though, when he is joined by an exact doppelganger, also played by Rockwell. Given the costs involved, it is little wonder the current fashion for science-fiction is to focus on giant robots and scary monsters. Moon, in contrast, harks back to more cerebral classics from the genre's golden years - films like Blade Runner, Solaris and 2001: A Space Odyssey. "Science-fiction is a broad genre," its director says. "It is much broader than westerns or war movies because you can tell serious stories. "Now, though, it seems restricted to bigger-budget, effects-driven films that generally rely on going from set-piece to set-piece." The fact that Moon's release coincides with the 40th anniversary of the Apollo moon landings is not lost on Jones. At no point, though, was he under pressure to include his father's seminal song Space Oddity - also celebrating its 40th anniversary this year - on his film's soundtrack. "I've always wanted to steer away from that," he says. "I think that would have really defeated the purpose of doing it independently." Having seen Moon at the Sundance and Tribeca Film Festivals, Bowie was not at the Edinburgh Film Festival for its international premiere on Saturday. Jones, however, is happy to report that his father "loved it" and that he was "a proud dad" as a consequence. Given Bowie's occasional appearances in films such as Labyrinth and The Hunger, it is not inconceivable that father and son might work together one day. If it ever happens, however, Jones believes he "would need to have a few films under my belt first". "I would have to feel absolutely confident I was a capable director, as I wouldn't want to put any pressure on our valuable relationship," he explains. "I'd also want people to know he was in my film because I want him in it, not because I need him to be." Moon is out in the UK on 17 July.